In 2014, an unprecedented outbreak of Ebola virus in Liberia, Sierra Leone, and Guinea shined a harsh spotlight on global capacity to deal effectively with a fast-moving epidemic that crossed interna­tional borders. Given the seriousness of the situation, the U.S. Agency for International Development (USAID) Office of U.S. Foreign Disaster Assistance (OFDA) deployed a Disaster Assistance Response Team (DART), as an interagency platform for coordinating operations to end the outbreak. Although the deployment, which scaled up earlier assistance, took place five months after the first reported cases and required extensive adaptation of standard practices, it succeeded in helping bring the epidemic under control: the total number of people infected—28,616—was well below the potential levels predicted by the CDC’s models. There is much to be learned from the U.S. response and the importance of collaboration and coordination in its efforts to save lives. Responding to Global Health Crises. 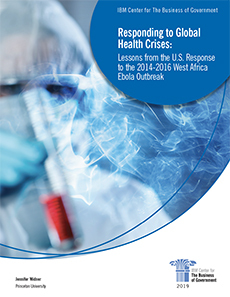 The IBM Center for The Business of Government has released, Responding to Global Health Crises: Lessons from the U.S. Response to the 2014-2016 West Africa Ebola Outbreak, by Jennifer Widner, professor of politics and international affairs, Woodrow Wilson School at Princeton University. This is a case study that highlights the challenges of making an interagency process work in the context of an infectious disease outbreak in areas where health systems are weak. Professor Widner, who directs the Innovations for Successful Societies, a Woodrow Wilson School research program on improving government performance, has extensively researched and reviewed the U.S. DART deployment to stop the spread of an infectious disease and how collaboration amongst multiple agencies, across national governments, and a full spectrum of global partners were integral to the U.S. response. This report is based on original research and extensive interviews of DART leadership and key stakeholders involved in the response. For purposes of illustration, the DART response is broken into four phases. Under each phase Widner details insights and key lessons learned. Based on these insights and lessons learned, the report provides practical advice on ways to effectively collaborate across agencies and national governments. From this rich narrative, the author also conveys the actions taken by the Ebola DART to ameliorate and transcend some of the core challenges faced when mobilizing a response to a global health crisis. Insights and Lessons Learned. The report highlights specific insights and lessons learned that can help others in similar situations more effectively manage interagency collaboration. Many of these insights offer value and are applicable beyond a crisis response context. Overcoming differences in procedures and organizational culture. Integrating new partners into a DART would require that team leaders negotiate differences in procedures and organizational cultures on the fly. Leveraging the value each response partner brings however limited.A crisis response may require the coming together of diverse partners, who contribute unique assets and resources. Depending on the crisis, these partners may stake out a specific role to play that may be limited in scope and contribution. Response leaders must work with what they can get from each partner. DART leaders in this case had to work with a rather reluctant U.S. military. Establishing geographical scope. Nailing down geographical scope of the response was a challenge. The DART team decided to focus on Liberia, where the outbreak was most serious, the country’s president had reached out for help, and the U.S. government had the deepest relationship. If the infection spread, the DART could expand its scope. Developing a structure for collaboration. Successful interagency collaboration rests on establishing a foundation, a structure from which to engage and exchange information, knowledge, and capacity to meet the ever-changing demands of a response. Planning for the response and exit. Though more familiar, because it was part of every OFDA operation, a fifth challenge was to plan not just for the emergency but for exit. Funding the DART mission. The sixth challenge was money—how to pay for an unusual mission, which came two months before the end of the U.S. government’s budget year, when funding accounts were almost depleted. Unique nature of the Ebola crisis and response. The Ebola crisis differed significantly from other types of natural disasters, in which most deaths occurred immediately and conditions then improved. In an epidemic, the number of infections would continue to increase in the short run, no matter what anyone did. According to Professor Widner, DART staff often described their work as “building the plane while flying,” which was an apt description for the Ebola crisis. Before responding to a disaster, end goals, roles, and protocols must be clear, but leadership could plan only up to a point. We hope that this report, which tells a story about effective crisis response collaboration—and from that story offers insights, reflections, and lessons learned—can help goverment leaders and stakeholders who may encounter similar situations to prepare and respond effectively and efficiently.